Middough, a nationally ranked 65-year-old locally-based engineering company, has been chosen to design a facility to move high-voltage power from the planned wind farm in Lake Erie to Cleveland Public Power's system. Details here. CLEVELAND, Ohio -- Cuyahoga County wants to support the wind turbine project in Lake Erie by purchasing a portion of the output for the next 20 years. To do that, the county plans to switch 15 of its buildings, including the Justice Center complex, to Cleveland Public Power, which would buy the power for the county from the Lake Erie Energy Development Corp., or LEEDCo, and re-sell it at cost to the county. CPP has already agreed to buy 25 percent of the nearly 21 megawatt output of the six-turbine pilot project. The turbines will be built 7 to 10 miles offshore northwest of downtown and be barely visible from the city. County Executive Armond Budish has asked County Council to authorize the administration to negotiate a power purchase agreement with CPP. Council is expected to assign the request to a committee at its upcoming Tuesday meeting. Budish said the deal, at a discounted rate, would be expected to save the county $2.5 million over 25 years and create about 500 new jobs in the next 10 years. Mike Foley, the county's director of sustainability, said by law the county cannot contract for more than 10 years, but LEEDCo needs at least a 16-year contract in order to meet the terms of the $40 million grant the U.S. Department of Energy has awarded the project. He said the county anticipates signing a second 10-year contract at the end of the first decade of operation. Foley said the county would also ask for legislation in the fall authorizing it to negotiate with a still-to-be-determined investor of a 4 megawatt solar array that would be located on a 25-acre brownfield. "This would be a test case for large-scale urban solar," said Foley. "We would be combining solar and wind and supporting locally generated clean energy." The village of Minster in north central Ohio had a similar-sized solar farm built in 2015. An independent investment group paid for the project, taking advantage of a generous 30 percent tax credit and accelerated depreciation for the first five years. Such arrangements allow for the city or county to purchase the array after the depreciation has lowered the market price. Solar panels are guaranteed 20-to-25 years. Ohio Congresswoman Marcy Kaptur on May 27 announced that "Cleveland’s Wind Project qualifies for a [U.S. Department of Energy (DOE)] grant of $40 million in additional funds” to construct turbines on Lake Erie, "unlocking the tremendous offshore wind energy potential of the Great Lakes, which represents 20 percent of the United States’ total offshore wind energy capacity." Fred Olsen Renewables, the largest independent power producer in the United Kingdom and the fifth largest in Europe, is expected to raise the remaining $70 million. Fred Olsen Renewables is enthusiastic about the upcoming collaboration. This exciting project began in 2006 as a citizen initiative, named Windustrious Cleveland. As a longtime resident of the city, I have deep respect and affection for its industrial core, and regret that much of it is now underutilized. Ten years ago I realized that, a few miles offshore on Lake Erie, there were strong steady winds that could be used as a clean source of power. In doing so, Cleveland could create a new manufacturing center, involving the building, installing and maintaining of wind turbines. Many people, with a variety of skills, would find rewarding work. On top of that, such an installation would be the first offshore wind farm in fresh water in the world. Our city would take on a leadership position. It was important to build grassroots as well as official support for this idea. With the aid of creative web designer, Dennis Yurich, I launched the Windustrious website. Jeff Moyer, an inspired composer, wrote and performed a beautiful theme melody for the project. Members of the public, as well as organizational and industry leaders, were encouraged to express their support, and were featured as Windustrious Champions on the website. To push the project ahead, powerful voices were brought on board, including the influential Cleveland Foundation in 2006. Many public officials were lobbied, as well as heads of environmental and community organizations. I met and talked with members of the wind industry and other industry leaders. I wrote letters, gave presentations, and supported wind energy for Lake Erie at every opportunity. Ronn Richard, President of the the Cleveland Foundation, together with Bill Mason, Cuyahoga County Prosecutor, created the Great Lakes Energy Development Task Force. Subsequently many studies were done to investigate the potential for installing a wind farm on the Lake. An official project, the Lake Erie Energy Development Corporation (LEEDCo), was launched in 2009, and geological and further analyses were completed. The current exciting development was fostered by the climate of receptivity and creativity that we initiated. DOE gave small grants to the project at earlier stages, and has now decided that the project's standing among the various competing requests for funding now merits the really large grant that had always been on the horizon. The green light given to this endeavor by the U.S. government is an enormous boost to the project. Some obstacles, however, may still pose challenges to the successful exploitation of Lake Erie’s powerful and steady wind resource. The lake is the shallowest of all the Great Lakes, which greatly facilitates the placement of turbine bases, but the lake bottom is not as dense and firm as might be wished. This is where the technology developed by Universal Foundation (a company majority owned by Fred Olsen Ocean) comes into play. Their "suction bucket" foundation permits firm anchoring on even the softest of underwater terrains. This is important, as the fresh water of Lake Erie can freeze in a severe winter, imposing appreciable stress on the wind turbine's tower. But the choice is yours and mine. See the turbines spin increase. There is wind on the water, evermore. We’ve completed construction of a new 100m windmill at the RSPB headquarters in Sandy, Bedfordshire. It will generate half of the RSPB’s total electricity needs across all of their 127 UK locations and will be bird and bat friendly – watch the video to find out how we did it. CLEVELAND, Ohio -- The U.S. Department of Energy is advancing another $3.7 million to the Lake Erie Energy Development Corp. to continue engineering work on a proposed wind turbine project in Lake Erie about seven to 10 miles northwest of downtown Cleveland. "This additional funding will support LEEDCo's offshore wind research and development progress and work associated with permitting, ... [and with an interconnection] agreement, installation and operations and a maintenance plan," the DOE wrote in a memo to the Ohio Congressional delegation. The grant is the third the DOE has awarded to LEEDCo, bringing the total federal funding to $10.7 million. Previous grants have helped pay for the development of foundation engineering designs. The energy department made LEEDCo an alternate or runner-up in 2014 when it announced it would be awarding $47 million grants to offshore projects in the Atlantic Ocean. But those projects have run into engineering and political problems while LEEDCo has continued to work on the hard engineering involved in placing wind turbines in fresh water, where ice poses an extra foundation problem. LEEDCo has achieved significant milestones and overcome all of the weaknesses identified in [earlier] evaluations." LEEDCo is hoping the energy department will now declare it a finalist and move a primary grant to the lake project since the ocean projects have not met the government's rigorous engineering development schedule. LEEDCo's decision last year to partner with Norwegian wind developer Fred.Olsen Renewables, the largest independent power producer in the United Kingdom and the fifth largest in Europe, should help. Fred.Olsen has incorporated a U.S. subsidiary and intends to buy LEEDCo's assets. In the mean time the Norwegian developer has been paying some of the bills. The $3.7 million DOE grant depends on the LEEDCo and Fred.Olsen partnership providing a $1.9 million cost share, according to a DOE memo, making the total funding now available nearly $5.6 million. David Karpinski, an engineer and LEEDCo vice president, said the DOE had indicated in November that the project was on track to receive the $3.7 million. "This grant will take us through another year of detailed engineering work," he said. "Fred.Olsen is contributing a cost share now." Karpinski said the goal now is to complete detailed electrical and mechanical engineering designs -- everything from the wiring and transformers, to underwater cables, to exact foundation specifications and even details as small as ladders on the turbine foundations. The goal is to have the wind turbines built and functioning by the end of 2018, he said. U.S. Democratic Rep. Marcy Kaptur, the ranking member of the House Energy and Water Appropriations Subcommittee, said her goal at this point is to convince the DOE to make the LEEDCo project a finalist and eligible for major future federal funding. "LEEDCo has achieved significant milestones and overcome all of the weaknesses identified in DOE's  project evaluations," she said in a statement issued late Wednesday. 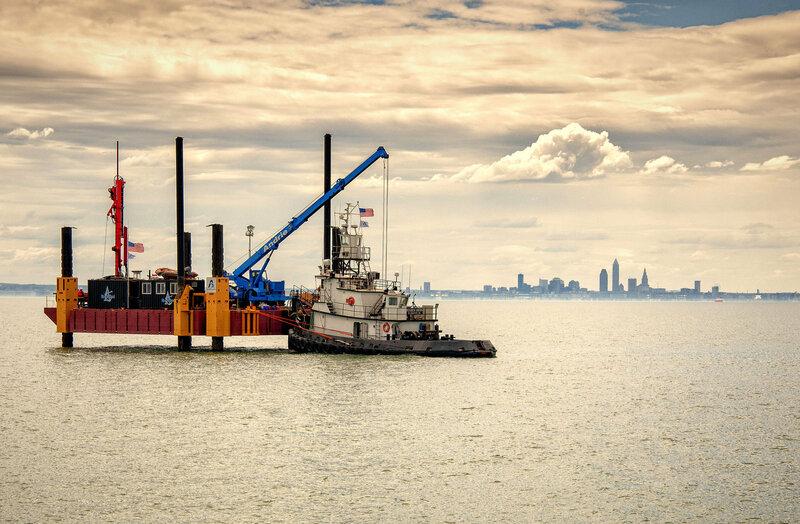 "This ... project will begin to unleash Lake Erie's full renewable power potential and contribute to creating a more competitive energy marketplace." As originally conceived when the Cleveland Foundation awarded the first grant to the project a decade ago, off-shore Lake wind farms were thought of as having the potential to generate hundreds, if not thousands, of megawatts -- as much as a fleet of conventional power plants, either coal or nuclear. The idea was that such a development would have a good chance of creating thousands of manufacturing jobs in Northeast Ohio. That goal has not disappeared. LEEDCo is aiming to build a 20-megawatt demonstration project, not a commercial wind farm. In other words, this is a proof-of-concept project. Current cost estimates, including the research and development already under way, are between $120 million and $128 million. Fred.Olsen Renewables is expecting to raise about a third of that money through private investors. The company is talking to banks, both here and in Europe to finance the remainder. LEEDCo plans to use six turbines designed for off-shore wind farms around the world on foundations designed to withstand ocean wind and current conditions. What makes the LEEDCo project different is that it would be the first off-shore fresh water project, meaning the foundation designs would have to be able to withstand ice on the surface as well as underwater ice floes and ice dams. In early 2016, the Royal Society for the Protection of Birds (RSPB) installed a large wind turbine at their headquarters in central England. The 100-meter (330-foot) tall turbine was installed at the Society’s headquarters in Sandy midway between Milton Keynes and Cambridge. The 800 kW Enercon turbine began operation in February and is expected to generate 1.85 million kWh annually, about half the electricity consumed by the 127 RSPB facilities across Great Britain. The RSPB is the British equivalent of the National Audubon Society in the United States or the Ligue de Protection des Oiseaux in France. The project is a partnership between the RSPB and Ecotricity, a private developer of distributed wind turbines. I’ve written about the RSPB’s plans previously (see Britain's Royal Society for the Protection of Birds Plans Large Wind Turbine) and have included a passage on the project in my new book Wind Energy for the Rest of Us. An article by Craig Morris tipped me off that the turbine was finally slated for installation. The society’s move stands out in a sea of timidity, hype, and greenwashing from groups in North America. The RSPB and the Audubon Society have publicly made the case that they support the responsible use of wind energy to address climate change and reduce pollution and habitat destruction from fossil fuels. The RSPB specifically notes that they have objected to only 4.5 percent of the 1,500 planning applications for wind projects in Britain they have reviewed. In contrast to the RSPB’s courageous stand in support of wind energy, North American environmental groups have been content with building renovations (Audubon), and the installation of token wind turbines (Nature Conservancy) and some modest solar demonstration projects. The RSPB’s Enercon is not a token turbine. It is not a “demonstration” project. The 53-meter (175-foot) diameter wind turbine is a modern machine that could be found installed singly and in small clusters by farmers in Germany or in wind farms by commercial wind developers throughout the British Isles. Ecotricity operates several of the German wind turbines in prominent locations. For example, they installed an Enercon wind turbine like that at the RSPB’s headquarters alongside the M4 motorway from London to Bristol. I am not aware of any examples in North America of the Audubon Society or any other environmental group installing an equivalent size wind turbine. In the early 1980s, Bill Hopwood and I installed a pioneering 1 kW Bergey at Beechwood Farms Nature Reserve near Pittsburgh for the Audubon Society of Western Pennsylvania. The wind turbine was joined by a 1.5 kW PV array. Unfortunately, the turbine has been out of service since 2002 and there are no plans to repair it. In 2007, the Audubon Center of the North Woods installed a 2.4 kW Skystream at its Crosby Lodge between Minneapolis and Duluth, Minnesota. That demonstration turbine is still operating. Both the Bergey and the Skystream are real wind turbines, but they are quite small by today’s standards. The Nature Conservancy "wind turbines" (they are more correctly identified as lawn ornaments) will produce — at best — tens of kilowatt-hours annually, if they produce any net energy over and above that consumed by their inverters. At a time of planetary emergency, such “greenwashing” by the Nature Conservancy and others — at a minimum — does little to further the use of renewable energy. At worst, it serves critics who continue to argue that wind turbines don’t work. Such “demonstrations” also feed despair that we can never scale up renewable energy fast enough to make a difference. The often naïve and poorly informed positions of groups such as the Nature Conservancy in Indiana differs strikingly with the sophistication of the RSPB's proposal and its accompanying defense of why it is taking such action. Watching this video of project, Constructing a wildlife friendly windmill for the RSPB, it’s hard not to be inspired. In his companion statement at the dedication of the turbine, Dale Vince, Ecotricity’s founder, sounds like an American revolutionary, or as they say in Germany, an electricity rebel. “Green energy puts power in the hands of the people — the technology allows us to democratize and decentralize energy in Britain,” he said. Indeed, let’s hope RSPB’s bold move stirs environmental groups in North America to drop the greenwashing and tokenism that has so characterized their renewables efforts so far. This article was originally published by Wind-works.org and was republished with permission. Ohio News - "The Ground continues to Swell, for Offshore Wind Power on the Great Lakes"
Around Northeast Ohio there is great interest and support amongst the public at large, and from many businesses and organizations, for the move to make use of the free, clean and everlasting renewable energy blowing out there on Lake Erie - and beyond. A four minute YouTube video demonstrates this very effectively - and shows that this potential can excite even the youngest amongst us!, http://youtu.be/ww2tK9Aoe1I . CLEVELAND, Ohio -- A Norwegian wind farm developer with experience in the North Sea will build the $120 million pilot wind farm planned for Lake Erie. Fred.Olsen Renewables, the largest independent power producer in the United Kingdom and the fifth largest in Europe, has already partnered with the non-profit Lake Erie Energy Development Co., or LEEDCo. The two companies have signed an agreement that Fred.Olsen will buy LEEDCo's research assets early next year, said Lorry Wagner, LEEDCo president. He declined, at this time, to reveal the selling price. LEEDCo. has been planning a six-turbine pilot project in Lake Erie that will be located eight to 10 miles northwest of downtown Cleveland and generate about 20 megawatts of electricity at peak output. The company has a 50-year lease from the state for the project and is working to complete the more than one dozen permits it needs from federal and state agencies. The turbines will be slightly larger than the one at Lincoln Electric near Interstate 90, but from shore they will appear to be about the size of half a dime on the horizon. Fred.Olsen has already incorporated its U.S. subsidiary, Fred.Olsen Renewables USA, that will be headquartered in Cleveland and direct future development. ... And we think a pilot project is a great way to start and also the best way for local industry to get involved." Fred.Olsen intends to pay for the project with loans it is now discussing with a Cleveland bank and with its own cash. The company plans to rely on U.S. manufacturers and local labor to build this project and future projects in the Lake. The construction of the pilot project alone is expected to pump $80 million into the regional economy. LEEDCo's mission has been to prove wind farms can work in the lake and create the conditions to help Northeast Ohio become a wind turbine manufacturing center -- supplying turbines and foundations and installation vessels not only to Great Lakes wind farms, but also to those off the East Coast, which does not have the manufacturing capabilities of the Midwest. David Brunt, CEO of Fred.Olsen Renewables, said Lake Erie has the long-term potential generating capacity of about five gigawatts of electricity. That's roughly equal to the output capacity of five large nuclear power plants. "We see potential in this. And we think a pilot project is a great way to start and also the best way for local industry to get involved," he said in an interview. Fred.Olsen has already on track to spend "several million dollars" in the project, he said, but declined to be more specific. The company paid for the crews and equipment that drilled core samples from the lake bed last summer. The project is in-line to receive up to $40 million from the U.S. Department of Energy next summer, said Wagner, because some of the ocean-based projects originally designated for the big federal grants are failing for one reason or another and won't get them. "The DOE needs a success. We are clearly the one project in the country that can deliver that," he said. The two companies expect the six-turbine LEEDCo pilot project will be generating electricity by the summer of 2018. That power will flow through a Lake bed cable to a substation at Cleveland Public Power and then into the regional grid where any company can buy it. CPP has agreed to buy 5 megawatts of the 20 megawatts the project will generate. Wagner said American Municipal Power will buy some of the power as will the Lakeshore counties that have joined LEEDCo. But most of the turbine project power is still up for sale, and Brunt and Wagner said the companies are looking for other utilities or power companies to sign long-term power purchase agreements. Wagner recently told members of Cleveland City Council's utilities committee that LEEDCo has approached FirstEnergy "many many times and at this point they have refused to participate." Though the electricity will be more expensive than electricity available from traditional power plants, it will only be a small percentage of the electricity CPP delivers. Residential customers will see an 87-cent increase in their monthly bills, said CPP Commissioner Ivan Henderson. Wagner said the price of the project's power will be above market prices for the first 10 to 15 years while the company pays off the construction debt but far below market prices after that. Cleveland Public Power has set a voluntary goal that 15 to 20 percent of the power it sells come from renewable sources, said Henderson. A state rule requiring Ohio's investor-owned utilities to source 12.5 percent of their power from renewable sources like wind and solar by 2025 is currently frozen following a utility lobbying campaign led by FirstEnergy to repeal the law. Lawmakers must enact new state renewable energy rules by the end of 2016 or see the old rules come back to life. Gov. John Kasich has threatened to veto any new legislation that permanently eliminates renewable energy mandates. Edited by the author to clarify LEEDCo's mission and Fred.Olsen Renewables status as a wind farm developer. Tore Wizelius and Ake Frykberg, of ReWind Offshore, came to Cleveland to share their experience of installing the world's first freshwater wind farm! The recent visit to Cleveland by two representatives of the Swedish company, ReWind Offshore, which created the world's first freshwater wind farm, generated much excitement. In a presentation at Case Western Reserve University on November 26th, Tore Wizelius (the Project Director) and Åke Petterson Frykberg (the CEO), talked about the installation of the ten turbines on Lake Vanern, their plans for a second larger installation, and then they opened up the room to vigorous discussion. The latter centered not just on the features of this pioneering engineering project, and the new ideas and techniques that it had generated, but it also inevitably led into thoughts about transferring that knowledge into use here on our own large body of fresh water. A recording was made of Tore and Åke's presentation, and while the audio and visual quality is not perfect, a good appreciation can be had of the Swedes' great contribution to advancing the essential use of this plentiful, benign and free form of energy. Part 2 at http://youtu.be/zNbeWL5m4X8 . Onward and upward was surely the message that was brought to our shores by our far-sighted Swedish visitors.